Their fingertips are just about touching that aim – stand on their tip-toes and they can probably grab it. 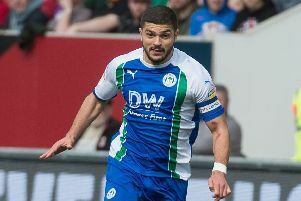 And in a game of contrasts, Latics need the points just as much at the DW on Sunday – probably more – as they aim to kick themselves free of the relegation trap door. Depending on how Rotherham get on against Stoke this afternoon, a win for Wigan (admittedly against the odds) could push them five points clear with four games left. Not safe, but it would offer some breathing room. And in order to achieve that, Cook is holding off congratulating those at one of his former clubs for now. “I think first and foremost, before games managers have to not lay plaudits but acknowledge what other teams are doing,” he said. “I enjoy the challenges of the bigger games for sure, I enjoy the fact there’s going to be a big crowd. In a very short space of time Norwich will get the accolades they deserve but not from me today. That brief is very simple. The aim of Cook and his players is to secure the club’s Championship status for next season, after a bumpy ride in contrast to last season’s cruise to the League One title. “The fundamental observation from everyone is you’ve moved up a league,” explained Cook. “We were capable of taking all before us last year and unfortunately we’ve now moved into deeper waters and within those deeper waters are bigger fish and bigger fish can eat you. “There has to be a process for pain, including defeats that we get. Cook cited individual errors for their defeat at Hull last Wednesday, as he looks for reasons their form on the road has been so poor this term. But he insists that doesn’t mean he is blaming players.